Dreamworks and sequels tend to go together like bread and butter; you can pan the concept all you want, but the franchises churned out by the famous (and sometimes infamous) animation studio enjoy box office success beyond all measure and reach audiences of a variety of ages. Their Madagascar series, which began in 2005, has now stepped forward to receive it's latest iteration: taking our favourite bestial quartet across the countries of Europe. Continuing their everlasting quest to get home, lion Alex (Ben Stiller), zebra Marty (Chris Rock), giraffe Melman (David Schwimmer) and hippo Gloria (Jada Pinkett Smith) track down the penguins at Monte Carlo for assistance, where they are pursued by the ruthless animal control unit lead by the psychotic Captain Chantel DuBois (Frances McDormand). Finding refuge on board a departing circus train, the animals are tangled up in a conflict of interests to restore the circus' success in the public eye for their personal gain of arriving back home in New York - something which may be more difficult than they originally expected. Madagascar 3 adopts the same quirky and cartoonish visual style that it's predecessors used to such great effect, allowing for over the top slapstick and charming character designs. Despite their clean and polished appearance, the graphics never aim to simulate or mimic reality; something that helps to maintain the zany vibe the film carries throughout. The visuals are also complimented by a decent if forgettable soundtrack by Hans Zimmer - though one mostly built off recycled and, regrettably, tired pop songs. The stellar voice cast from the previous films reprise their roles with the same comedic appeal, which mainly stems from the hilarious Ben Stiller and equally funny Chris Rock. Newcomers Frances McDormand, Martin Short, Bryan Cranston and Jessica Chastain also perform well, even if a few of them have forgettable roles. 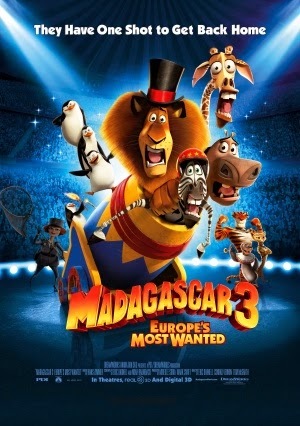 Madagascar 3's main problem lies with pacing, which is often shunted aside in favour of comedy and sometimes forced set pieces. The film kicks off within minutes and comes to an almost abrupt end which doesn't feel all that organic; not only this, but the plot structure is overwhelmingly formulaic, making certain scenes lacking any sort of punch or purpose. Madagascar 3 is a funny and entertaining effort from Dreamworks, which in hindsight is all it's meant to be. It won't win any awards for narrative development - but do you care? I sure hope not. A great laugh for adults and kids alike and one packed with charming characters and hilarious slapstick gags, Madagascar 3 pretty much succeeds and what exactly it aspired to do, albeit without a great deal of originality or innovation.